Your neighbor bursts into your house and exclaims “I just read this article…You buy a stock and sell an option and cash flows into your account instantly. It’s a miracle! I’m getting started tomorrow” If you are a good neighbor and knowledgeable about covered call writing you will immediately tie him to a chair, put tape over his mouth and explain to him that there is no such thing as a free lunch. There is so much more to this strategy than what your neighbor read in the article. The most vulnerable investor is the one who thinks he knows everything but in reality knows very little. He must learn when to begin risking his hard-earned money and what his goals should be. Should we look for the highest returns? Many covered call writers do. As a matter of fact, some subscribe to newsletters that generate lists of the highest ranked stocks based on option returns…very dangerous. Since there are two components to this strategy which is more important, the stock or the option? Which option do we select? If your neighbor is not prepared to answer these questions, he is not ready to execute trades. What if the trade turns against him? Can he control the outcome? He doesn’t know! Didn’t think of that… well then he’s still not ready…keep him tied to that chair. Explain to Mr. About-to-be-broke that there are pitfalls to watch out for. Tax issues…maybe. Has he decided on which brokerage makes the most sense using this great strategy? No…the tape stays on. Give him a pen and paper. How many positions should you hold? How much cash should be allocated to each position? Specifically, which system will he employ? If the paper remains blank, show no mercy. You’re simply being a good neighbor and he will thank you for it. Your Books, Your Blog, Your Video’s all fantastic!! Clean, sharp and logical!! The system/report is going great, I am now into my 6th month of paper trading and I’m about to go live in the next couple of weeks. My returns have been 2-5% per month over this period, which when compounded is a fantastic return. Master the strategy– Practice the system- Generate Cash- Become CEO of your own money. Business inventories ( A report of the dollar value of product inventories held by manufacturers, wholesalers, and retailers. Included in the report is the inventories/sales ratio, a gauge of the number of months it would take to deplete existing inventories at the current rate of sales, which is an important indicator of the near-term direction of production activity) rose slightly (0.1%) but less than the 0.3% anticipated according to the Department of Commerce. I want to thank you for this article and video and let you know that I’m really glad I found your site. I’ve been doing covered calls for over a year and find myself guilty of most of the mistakes you talk about. I’m looking forward to taking your advice and improving my results. Thanks a lot. Going for the highest premiums-guilty as charged. Thanks for the tip. Missed your last seminar in Atlanta, hope to make the next one. 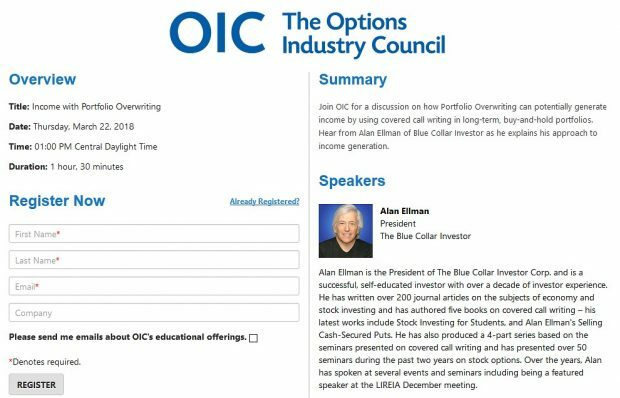 I’ll be back in Atlanta on Saturday April, 20th speaking @ The Atlanta Options Investor Club @ Georgia State University. Keep an eye on this site for further details. I hope to meet you in person at that event. when are you coming out to SoCal? Love to attend your seminar in the LA-San Diego area. You do a great job with the videos and the training. All the best. I’d love to come out to the west coast. Linda and I have family in San Diego and Los Angeles. Almost all my seminars come as a result of an invitation. If you know of a large stock investment club in your area that would benefit from a covered call writing presentation, have them contact me and we’ll see what can be worked out. I only have one or two slots available through the end of the year. Thank you for helping me to finally make a steady profit in the stock market. I noticed this week’s Running List (2/15/13) is formatted differently than usual. I really like the stocks listed by date of earnings reports but this week they are listed alphabetically. What’s up with the change? Thanks again for your valuable service. We just got back from our Money Show presentation (standing room only!) when I saw your post. First, great to hear of your investment success, thanks for sharing. When the stock reports are formulated the last step is organizing by ER dates. Evidently, the “almost finished” version was uploaded to the premium site. I will make sure the final version is uploaded this evening. Thanks. This week’s Weekly Stock Screen And Watch List has been revised and uploaded to The Blue Collar Investor premium member site and is available in the “Reports” section. The Running List Earnings Report section has been reorganized and sorted by earnings report date. Look for the report dated 02-15-13 RevA. No changes have been made to any screening data other than sorting by the earnings report date.